Yoga in Denver. Group and Individual classes available. Zoetic Counseling offers yoga in Denver. Group and individual classes available. Interested in yoga in Denver, but these thoughts keep crossing your mind? The benefits of yoga go beyond just building flexibility. When we experience anxiety, trauma, and depression often our nervous system is activated. This may appear as calm on the outside, but inside you are feeling confused, panicky, and anxious. The nervous system is responsible for our fight, flight, and freeze responses. It is also responsible for our rest and relax states. Consequently, the nervous system regulates our physical and emotional responses. Through breath and movement, practicing yoga in Denver helps calm our nervous system and helps us shift into a more relaxed state. Focusing on our breath helps us attune to our bodies. First of all, our bodies are intelligent resources that can give us many clues for healing. Secondly, society teaches us to disconnect from our bodies. While thinking and problem solving has incredible benefits, it takes us away from the innate healing power that our bodies possess. Our thoughts, feelings, and beliefs impact our biology. As a result, our body responds to emotions. Yoga strengthens our mind-body connection. Nurturing the mind-body connection helps to bring emotions back into balance. Yoga provides a space to strengthen mental and physical health. Yoga is about cultivating a non-judgemental space for you to explore sensations, thoughts, and feelings. Especially relevant, the mindfulness of a yoga practice lends in learning to not attach meaning to thoughts, feelings, or beliefs that arise. 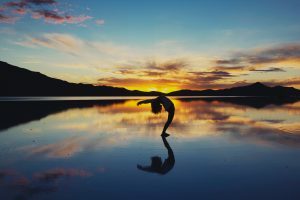 Overall, yoga in Denver supports you in learning to trust yourself! Discovering what calm, confident, and empowered feels like on the mat is only part of the practice. Furthermore, how we interact and engage with our environment off our mats is a true test. Attuning to our internal states and building awareness around how our minds and bodies interact strengthens our connection with self. Often these shifts can be observed in feeling less reactive in relationships with others. Yoga supports the relationship we have with ourselves and impacts our relationships with others. Contact Becky for more info about yoga in Denver.